The express-exterior car wash format may be changing the industry into a more impersonal business but there are still plenty of opportunities for folks who want a traditional mom and pop business. In the November 2008 issue of Auto Laundry News, I discussed the potential for waterless car washing to blossom into a trend. Back then, the waterless segment was basically e-commerce sites selling branded and private labeled products and eco-car wash kits as well as some new franchise opportunities, notably Pronto Wash USA LLC and Ecowash Mobile International PTY LTD (aka, NanoTech). According to its website, the franchise fee for Ecowash is $30,000. Total investment for a location is around $300,000. Royalties are 6 percent. Minimum requirements are net worth of $250,000 and $50,000 in liquid assets. However, Ecowash states there is currently no estimated income for any franchise location in the United States, and Pronto Wash has only 10 units in operation in the country. By comparison, there are now thousands of independent waterless car wash businesses located throughout the United States. There are also digital waterless car wash networks such as Always Glossy, headquartered in Austin, TX, and 1-800-CARWASH.com based out of Tulsa, OK (formerly, Wype.com). Glossy offers waterless exterior and interior car cleaning services using an eco-friendly solution. Via its customer portal, clients can lock in appointments at one of over 50 service locations. Arguably, robust growth of independent waterless car wash operators over the last decade provides some evidence that the value proposition for franchising waterless just isn’t strong enough. For example, we have worked with manufacturers of waterless car wash and detail products to develop start-up kits for both mobile and location-based operations. Generally speaking, we find the start-up expense for a mobile waterless unit is only about $10,000. This includes materials, smartphone, website, customer app, car lease deposit, and capital to cover six-months of operating expenses. The start-up expense for a location-based waterless car wash operation is around $125,000 (ground lease). Typical properties include renovated gasoline stations or leased space in a parking garage or the parking lot of a mall or shopping center. In terms of service rate, a team of two people can complete an exterior wash in 15 minutes, full-service 30 minutes, and hand wax 20 minutes. So a mobile unit is quite capable of processing 15 to 20 cars a day. Location-based operations have similar service rates and 60 cars a day or more is possible with a staff of between seven and eight employees. Waterless car wash prices are around $20 for exterior, $40 for full-service, and $60 and up for detail services (e.g., hand wax). Due to the nature of the work and pricing structure, waterless washers have the potential to earn between $15 and $20 an hour plus tips. Operating expenses as a percentage of sales revenue is 50 percent for a two-person mobile unit and 65 percent for a location-based operation. Generally speaking, we find mobile waterless units generate annual sales revenue of between $50,000 and $100,000 and up to $400,000 for location-based operations. 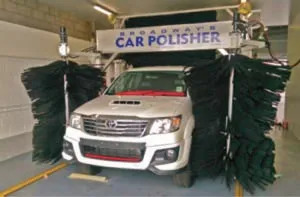 A hand car wash is similar to most traditional full-service facilities, except there is no automated equipment or very much in the way of support equipment. 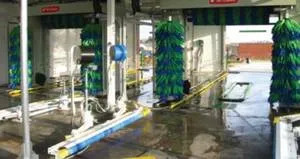 The two most common hand car wash layouts are pull-in/back-out service bays or a small drive-through style building. Typical properties include repurposed former gasoline stations, drive-through convenience stores, used-car lots, dry cleaners, small office buildings, etc. Basic equipment includes point-of-sale systems, prep gun, air compressor, water softener and heater, canister vacuums, utility carts, towels, washer and dryer, and inventory. Start-up expenses for hand washes are greater than a waterless operation at around $250,000 with a ground lease. Hand car wash service rate is similar to a commercial full-service wash at 20 to 30 minutes and requires a minimum of seven employees plus a manager. Prices are similar to a waterless car wash business, and operating expenses as percentage of sales revenue is around 65 percent. Generally speaking, we find hand car washes are capable of generating annual sales revenue of $400,000 or more. The express in-bay automatic has features such as a long wash bay and freestanding arches and air producers that allow it to produce two to three times the hourly volume as a standard in-bay. Moreover, longer bays can accommodate more profit centers that help raise average revenue such as tire shine applicator, rain repellent, etc. Property requirement is a minimum of 0.25 acres of land. Buildings will vary between 1,800 square feet for a single bay and 3,000 square feet for dual bays. Depending on size and construction method, start-up expense for an express in-bay including real estate has a range of between $750,000 and $1.2 million. An express in-bay has a throughput range of between 20 and 30 cars per hour and is quite capable of producing between 25,000 and 50,000 cars per year. It does not require an on-site attendant to operate, but we find sites that are attended perform better financially. Pricing for an express in-bay is usually similar to that of an express-exterior conveyor. Operating expense as a percentage of sales revenue is around 50 percent. Generally speaking, we find an express in-bay is capable of generating annual sales revenue of between $250,000 and $500,000. A mini tunnel is simply a condensed version of a full-size express-exterior conveyor. Requirements include a pay terminal, five- or seven-brush module, arches, high-pressure capabilities, support equipment, and profit centers such as tire shine applicator and rain repellent that raise average revenue. With one row of vacuums, minimum property requirement is 16,000 square feet. Buildings will vary between 1,800 square feet for a single tunnel and 3,000 square feet for dual. Start-up expenses for a single mini tunnel, including real estate, range between $1.5 and $1.7 million. The mini tunnel has a throughput ranging between 45 and 60 cars per hour with on-site attendants. Pricing is similar to that of an express conveyor. Operating expense as a percentage of sales revenue is around 55 percent. Generally speaking, we find the mini tunnel is capable of generating annual sales revenue of around $400,000. A Buff N’ Shine Center® is a business model that was developed by Broadway Equipment Company and deployed in and around Minneapolis, MN. An example of this can be found at Walt’s in Willmar, MN. Walt’s has a soft-cloth wash and automatic vehicle polisher plus oil change, convenience store, and gasoline. Today, a mom and pop version of this model would consist of two soft-cloth in-bay rollover systems and one vehicle polisher. This model requires 0.25 acres of land and a 3,200-square-foot building for equipment, mechanical room, and waiting area. Start-up expense, including real estate, would be in the range of $1.0 to $1.2 million. Throughput is similar to that of an express in-bay, and one operator can perfectly polish up to 25 vehicles per day. Pricing would be similar to full-service. Operating expense as a percentage of sales revenue would be around 60 percent.Six business models that provide a good standard of living. Based on performance of similar operations, we would expect such a facility would be capable of generating annual sales revenue of around $500,000. And finally, in an earlier edition of Auto Laundry News (“Flex-Serve Revisited,” November 2018, page 90), we provided a drawing and an overview for a condensed version of a flex-serve car wash. This model requires 20,000 square feet of land and a 3,000-square-foot building. Start-up expense would be similar to that of a high-end self-service or around $1.5 million. Capacity would have the same range as a mini tunnel. Minimum staff requirement is three people, average five, and maximum nine. Forty percent gross net business. We described six business models that mom and pop can use to establish an occupational business that provides a good standard of living and a high level of job satisfaction. Each of these models is affordable and provides a competitive advantage by means of differentiation and filling a niche market. Moreover, the level of personal attention and specialization of work required would serve as a barrier to entry.